Aquamarine received its unique name from the Ancient Romans, who associated this gemstone with the ocean and believed it could ensure a safe journey across the sea when carried on board a ship. This beautiful gemstone is composed of the mineral beryl and obtains its distinctive colouring from minute traces of Iron in the crystal structure. Depending how much iron is in the earth at the time of crystal formation, this gem can range from a deep teal to a pale, watery blue. The most sort after and valuable colour is an intense blue with very little green or grey undertones and no visible inclusions. The gemstone has a pleochroic effect, meaning that it shows different colours along different crystal directions. If you view the Aquamarine from a certain angle, it has the potential to appear to be blue, blue-green or colourless. Aquamarines are sourced from multiple locations around the world, with the most beautiful varieties coming from a range of countries including, Australia, Brazil, India, Kenya, Madagascar, Mozambique, Namibia, Pakistan and Zambia. 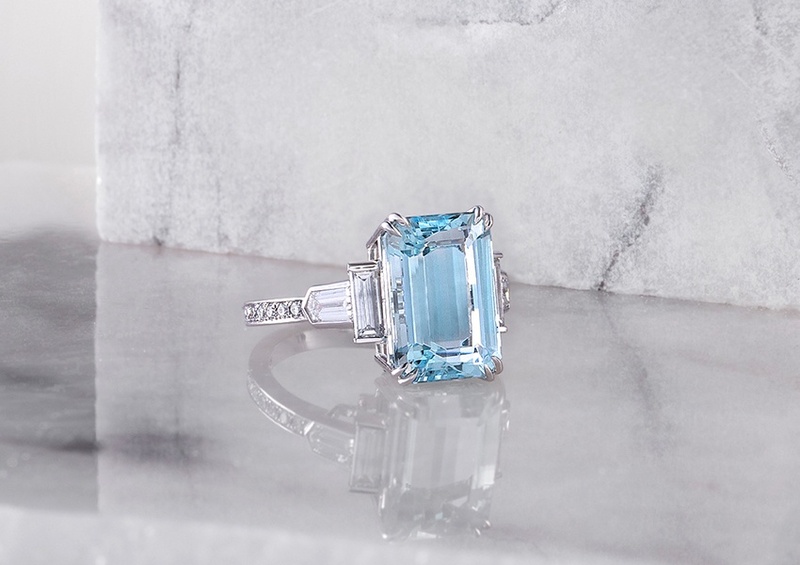 For those interested in including an Aquamarine piece in their collection, our Art Deco Inspired Emerald Cut Aquamarine and Diamond Dress Ring is an exquisite example of this gemstone’s vibrant colour. Featuring a 5.54-carat Emerald Cut Aquamarine with Baguette and Tapered Bullet Diamonds on either side, set in 18-carat White Gold; the gemstone highlights the ring’s elegant attributes, creating a piece that exudes pure magnificence. Aquamarine is one of the most durable gemstones around; making this ring perfect for those who wish to wear it on a regular basis. To learn more about our Art Deco Inspired Emerald Cut Aquamarine and Diamond Dress Ring, to arrange a complimentary consultation.